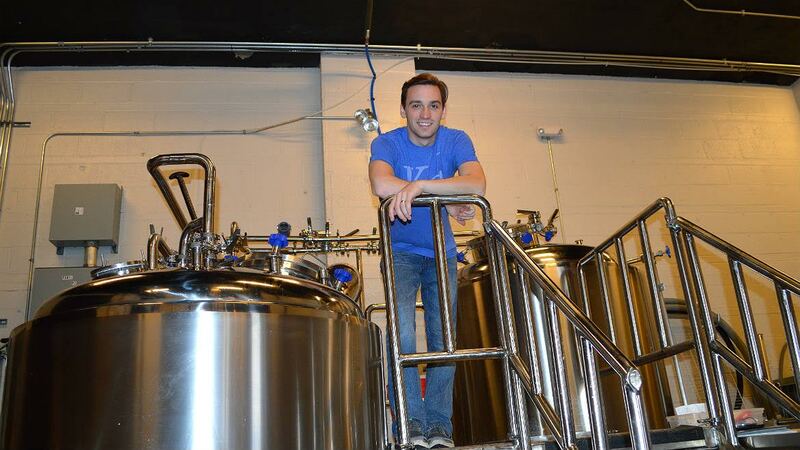 Founder and brewer Aaron Ogilvie is getting ready to open the Double Shift Brewing Company Saturday. Photo by Jonathan Bender. Aaron Ogilvie sits at the dark lacquered tables inside the Double Shift Brewing Company – his microbrewery and taproom slated to open in less than 48 hours at 412 E 18th Street. The tables, built by his hand, resemble indoor picnic tables with long benches. He runs a hand through his hair and exhales slowly. He hasn’t been sitting much the past two months. It’s been a series of 14-hour days for the firefighter that signed a lease on the former art gallery space last October. The Crossroads is a good candidate for where that beer community will congregate. When Double Shift opens Saturday at 12 p.m., they’ll join neighbors such as the Border Brewing Company (406 E 18th Street), which opened in February, and the Torn Label Brewing Company (1708 Campbell), which unveiled its new taproom earlier this month. Brewery Emperial is another brewery in the works at 1829 Oak Street. It counts Room 39’s Ted Habiger and Keith Thompson, the former brewmaster at McCoy’s, among its partners. Double Shift will open with a five-barrel system, which Ogilvie intends to use to produce five flagship brews along with a rotating monthly seasonal. The model of a small system that allows for experimentation is one that he’s seen be successful in Kansas City. He points to the two-year-old Big Rip Brewing Company in North Kansas City, where he spent a day as a guest brewer last year. “Big Rip forged the way. They did it well and they’re doing it well and that’s what made it click for me that now is the right time,” Ogilvie says. The brew house is visible through a large cut out in the wall behind the taproom bar. Eventually, Ogilvie expects to give informal tours. Double Shift, so named for the shifts Ogilvie sometimes pulls at the firehouse, will be open four days a week: 4 to 10 p.m. Thursday, 4 p.m. to 12 a.m. Friday, 12 p.m. to 12 a.m. Saturday and 12 to 8 p.m. Sunday. The brewery will launch with five beers – they’re kegging a pale ale today to join a Saison, rye, Double IPA and White IPA on tap. The brews will be available in flights, pints and growlers. “Our Saison is a pretty dry beer. It’s a little fruity on the back half. It’s light-bodied with a clean finish,” Ogilvie says. “Our rye is a little spicy, more like rye bread. Rye is one of those beers that’s underrepresented here in Kansas City. Those are the two brews that Ogilvie would recommend to someone new to his brewery or micro brews in general. “Session” beers are lower in alcohol, but still thought of as flavorful by drinkers. While Ogilvie will recommend the nearby Torn Label for hopheads, he is brewing a Double IPA that’s “hop forward with a nice woodsy, piney note and a little bit of caramel.” Double Shift uses dark caramel malt in its Double IPA to balance out the hops for a brew that is creamy at first sip. The White IPA isn’t exactly where Ogilvie wants it, but that process of perfecting a brew is part of what he sees as the journey for a new operation. “Our White IPA isn’t quite there yet,” Ogilvie says. “It has some wit and clove and it finishes with some bitterness from the dry hopping. Double Shift will have pretzels at the bar (Ogilvie is working with a local bakery to try and figure out soft pretzels), but they’re also hoping to establish a regular rotation of food trucks parked outside on the weekends. This Saturday, Pie Hole will be on hand with Australian meat pies. Ogilvie has plans to add a small barrel-aged program in the future along with some limited release beers.